Posted by dr. gonzo in History, National Register of Historic Places, U.S. Route 66. 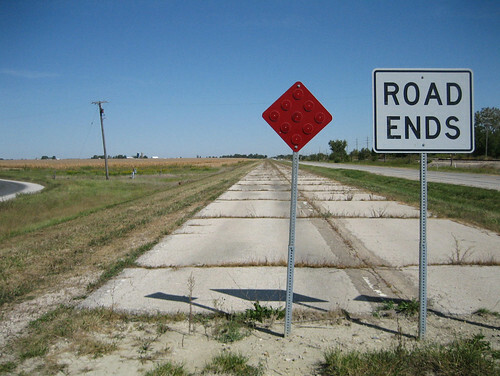 The 18.2 mile section of U.S Route 66 roadbed from the southwest corner of Odell Township to just north of Chenoa, Illinois, is one of several in the state listed on the National Register of Historic Places. We have taken a look at some of the structures that line The Mother Road over the past few days but the road itself holds important historic significance. This stretch goes through Pontiac, Illinois (home to a state correctional facility I once toured as a wee lad), but before you get to Pontiac, there’s The Mother Road. This section of Route 66 was commissioned in 1926 and has along its roadbed 8 key structures and 12 highway bridges. Parts of the original roadway are still in use, both north and southbound along this stretch. Where one side is in use, the other, though extant, is abandoned, this can be seen in the image above (taken north-northwest of Cayuga, Illinois). More information can be found in this section of the Wikipedia entry (again one I wrote and photographed for). Tomorrow we return north, to save the completion of our Route 66 journey for the future. Back to Belvidere and then over to Ogle County, one of my favorite places. Of course, just south of Chenoa, you have the site of the former Ballard Elevator. For years, this was a waymark of any 66 trip in this section. I’ve heard that there used to be a village there, but don’t think there was. I missed this site on my trip last fall, too busy hunting down other sites. But it won’t be the last time I make the trip, I am originally from Bloomington.